Nostalgia for the ‘90s from Gen-Xers and Millennials has driven Coca-Cola to re-introduce its sweet citrus drink, Surge. The beverage giant decided to bring back the fizzy favorite in response to strong social media demand from a Facebook group called “SURGE Movement.” The drink’s return proves the power of social media and the importance of listening to customers in this era when consumer feedback can make or break a brand. Buzzfeed.com posted on more on why Surge is making a resurgence. Surge is being sold in 12-packs on Amazon. This is the first time that Coca-Cola has sold a product exclusively online. But this is not the first time that Coca-Cola has brought back a product in response to fan demand. We all remember the infamous New Coke debacle of the ‘80s when the company changed that classic recipe. This left a bad taste in consumers’ mouths that led to public outrage and forced Coca-Cola to bring back the beloved first formula. Today, the only difference is that fans have direct access to brands and fellow fans through a variety of social media platforms. These can be valuable to brands if they use them to listen and respond to consumer feedback, but damaging if they don’t give the platforms and the people the attention they deserve. Coca-Cola clearly learned from their past product experiences and recognizes the importance of responding to social media demand. Surge was launched in 1996 to compete with Pepsi’s Mountain Dew. It was Coca-Cola’s most aggressive launch of a soda brand in that decade and initially received a strong response. But by the turn of the century, Surge was no longer selling and production ceased in 2002. But more than a decade later, the children of the ‘90s became nostalgic for the citrus soda and started a Facebook group called “SURGE Movement” to bring the beverage back. Once Coca-Cola learned that the group had more than 128,000 likes, they realized the huge consumer desire and demand for this beverage. Rather than risk the wrath of social media, they decided to bring it back. Already, sales seem to be surging. The first batch of Surge sold out in about an hour, but more is now available on the website and on Amazon. 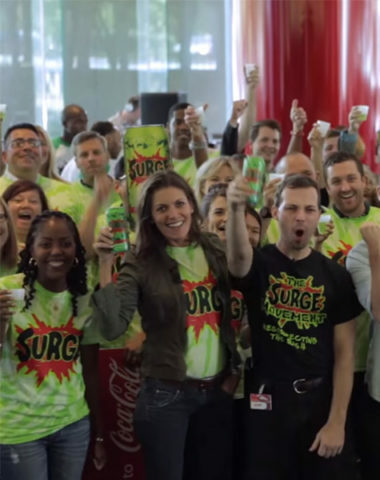 Coca-Cola plans to decide the future of the brand based on the excitement exhibited by Surge fans across America. Keep up with the latest in social media marketing. Contact MDG Advertising today at 561-338-7797 or visit mdgadvertising.com.